San Andres Island is known for nature, wildlife, beaches, adventure, and historic sites. 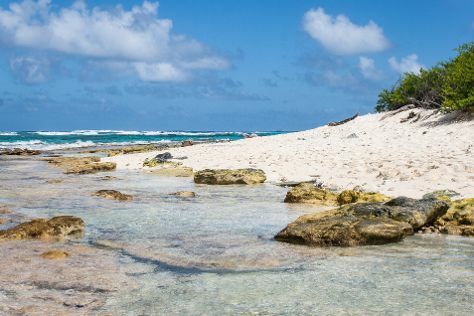 Your plan includes some of its best attractions: head off the coast to Johnny Cay, kick back and relax at Playa de San Luis, don't miss a visit to Blow Hole, and pause for some serene contemplation at Primera Iglesia Bautista. To find other places to visit, more things to do, where to stay, and tourist information, refer to the San Andres Island trip planner. Buenos Aires, Argentina to San Andres Island is an approximately 12.5-hour flight. The time zone changes from Argentine Time (ART) to Colombia Time (COT), which is usually a -2 hour difference. Traveling from Buenos Aires in January, expect somewhat warmer with lows of 28°C in San Andres Island. Wrap up your sightseeing on the 4th (Fri) early enough to travel to Cartagena. Cartagena is known for historic sites, museums, nightlife, nature, and adventure. Your plan includes some of its best attractions: step into the grandiose world of San Felipe de Barajas Castle, gain insight at Plaza Santo Domingo, don't miss a visit to Plaza Bolivar, and steep yourself in history at Walled City of Cartagena. To see reviews, photos, and more tourist information, read Cartagena trip itinerary maker . You can fly from San Andres Island to Cartagena in 3.5 hours. In January in Cartagena, expect temperatures between 36°C during the day and 28°C at night. Finish your sightseeing early on the 7th (Mon) so you can drive to Santa Marta. On the 8th (Tue), stop by Yo Amo Santa Marta and then explore the wealth of natural beauty at Parque Nacional Natural Tayrona. On the next day, enjoy the sand and surf at Playa Blanca and then see some colorful creatures with a scuba or snorkeling tour. To find traveler tips, ratings, maps, and other tourist information, go to the Santa Marta trip itinerary planner . Traveling by car from Cartagena to Santa Marta takes 3.5 hours. Alternatively, you can take a bus. 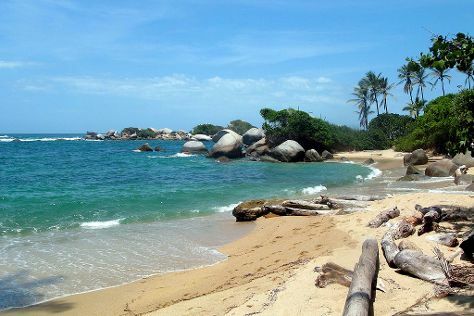 In January in Santa Marta, expect temperatures between 39°C during the day and 27°C at night. Finish your sightseeing early on the 9th (Wed) so you can travel to Guatape. On the shores of a large artificial lake, Guatape ensures a pleasant experience in a quiet little town known for its friendly residents and attractive architecture. On the 10th (Thu), pause for some serene contemplation at Iglesia de Nuestra Senora del Carmen, then get outside with Cable Paseo Guatape, and then explore the striking landscape at Piedra del Penol. To find maps, where to stay, photos, and tourist information, you can read our Guatape trip planner . Traveling by combination of flight and bus from Santa Marta to Guatape takes 5.5 hours. Alternatively, you can do a combination of bus and flight; or drive. Traveling from Santa Marta in January, expect Guatape to be cooler, temps between 25°C and 14°C. Wrap up your sightseeing on the 10th (Thu) to allow time to drive to Medellin. Medellin is known for parks, zoos & aquariums, museums, historic sites, and shopping. Your plan includes some of its best attractions: take in the local highlights with Walking tours, get engrossed in the history at Museo de Antioquia, steep yourself in history at Pueblito Paisa, and let little ones run wild at Parque Lleras. To see other places to visit, photos, ratings, and tourist information, read Medellin trip planner . Getting from Guatape to Medellin by car takes about 1.5 hours. Other options: take a bus. Expect a bit warmer temperatures when traveling from Guatape in January; daily highs in Medellin reach 32°C and lows reach 20°C. Wrap up your sightseeing on the 13th (Sun) to allow time to travel to Salento. Founded in 1842, the town of Salento represents the oldest established settlement in Quindio. Start off your visit on the 14th (Mon): appreciate the views at Valle del Cocora, indulge your taste buds at Food & Drink, and then identify plant and animal life at Kasaguadua Natural Reserve. Get ready for a full day of sightseeing on the 15th (Tue): explore the striking landscape of Bosques de Cocora. For more things to do, traveler tips, other places to visit, and tourist information, read our Salento trip planner. You can do a combination of flight and taxi from Medellin to Salento in 1.5 hours. Alternatively, you can do a combination of flight and bus; or drive. Expect a daytime high around 32°C in January, and nighttime lows around 20°C. Cap off your sightseeing on the 15th (Tue) early enough to travel to Bogota. Change things up with a short trip to Catedral de Sal in Zipaquira (about 54 minutes away). Next up on the itinerary: see the interesting displays at Gold Museum (Museo del Oro), explore the world behind art at Museo Botero del Banco de la Republica, tour the pleasant surroundings at Parque de Usaquen, and take your sightseeing to a higher altitude at Mount Monserrate. For maps, where to stay, and more tourist information, read our Bogota trip builder tool . You can do a combination of taxi and flight from Salento to Bogota in 2 hours. Other options are to do a combination of bus and flight; or drive. Plan for little chillier temperatures traveling from Salento in January, with highs in Bogota at 23°C and lows at 7°C. Wrap up your sightseeing on the 18th (Fri) early enough to travel back home.